Before the Rivals Starter released, we started drafting at Covenant Tulsa using a home brewed draft format created for Destiny Weekend. With the announcement of The Covenant Masters event series, there were several other Tulsans looking to practice drafting Legacies this past Wednesday at our local league night. I decided to stream my entire draft (video below), including everything from opening packs and drafting cards to building a deck and playing games. 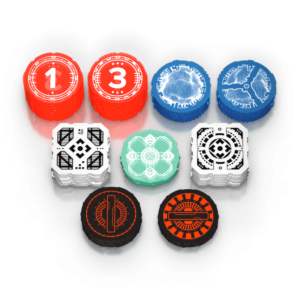 If you are new to drafting Destiny, before reading the rest of this blog I recommend starting with our introductory guide to drafting. The stream is a couple hours long, so I added time codes below for the most important moments of the stream. This past week, we also posted a poll on Twitter and Facebook to let you determine one of my characters for the draft. Unsurprisingly, the Jawa was easily the most voted on character. 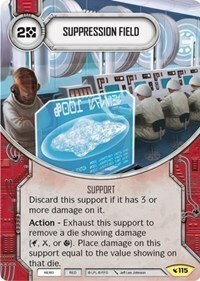 Below is the deck I built after drafting on Wednesday. Knowing that I would be drafting Legacies, the Jawa actually changed my drafting strategy. I ended up drafting a Battle Droid and a Jedha Partisan, which allowed me to field four characters with all three colors. Had I not planned on taking the Jawa, I probably would not have been in a position to take advantage of the opportunity to do this. While this is a powerful set of starting characters, it came with a down side. I spent two of my draft picks on characters instead of upgrades or control cards. I want to note a few cards that have surprisingly high value in draft. While not all of them were relevant on this particular stream, they are worth a second look if you have not spent much time drafting Legacies. Draft is quite a bit scrappier than constructed, meaning that games take longer and you take damage where you can get it. Suppression Field can ultimately remove up to three dice in a single game. If you happen to draft Rose, this card is insane since she has the ability to remove damage from supports. While a Jawa is not quite a Rose, he also works well since you can remove a die or two and then cash the Suppression Field in for resources with his ability. 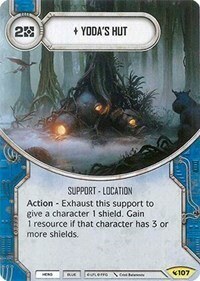 I cannot speak highly enough of Yoda’s Hut in draft. Even a single shield each round is good enough for this card to get played. Pair it with a character like Anakin who can reasonably give a character two shields and Yoda’s Hut gets insane. 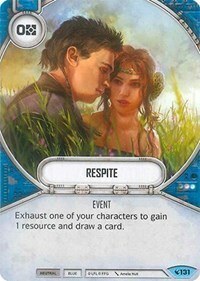 Respite is one of those cards that I was immediately drawn to, even in constructed. Turning a character activation into an immediate resource and card is hardly ever bad. The pacing of constructed might limit how often this card gets played in that format, but in draft this card is amazing. Since I knew I was playing four characters early in the draft, I was looking for as many of this card as I could get my hands on. You can join me on Wednesday nights at 6:30pm for the live stream or or in person at the first Covenant Masters qualifier event on June 23rd! Also, stay tuned to Twitter and Facebook as there will most certainly be more polls to determine what I play next.